IN 2012, after 244 years in print, Encyclopedia Britannica became online-only. Now a group of German fans of Wikipedia, an online, user-generated encyclopedia, are raising money for a move in the opposite direction. A print version of the English Wikipedia–1,000 bulky volumes and 1,193,014 pages–will be on show at a gathering of Wikipedians later this year. A world tour will probably follow: a global victory lap for the internet’s most impressive crowd-sourced creation. The books will be instantly out of date; several times a second an article is amended online. But that is not the point. Wikipedia, which was founded in 2001 by Jimmy Wales and Larry Sanger, has a right to show off. With articles on subjects as diverse as Spaghetti code (“a pejorative term for source code”) and SpaghettiOs (“an American brand of canned spaghetti”), it has 1,600 times as many articles as the Encyclopedia Britannica. It is the world’s fifth most popular website, with editions in 287 languages. (The English one is the biggest, with 4.4m articles.) On any given day 15% of all internet users visit it, amounting to 495m readers a month. Chinese pupils are once again at the top of international education rankings. Recent further in-depth analysis of results from the 2012 Programme for International Student Assessment (PISA) tests, have now shown that it’s not just pupils from Shanghai and Beijing coming top of the class. Children from rural areas and disadvantaged environments of China also outperformed peers in other countries. UK education secretary Liz Truss is leading a visit to China with a group of teachers to observe why. But she should be mindful of copying a system that is being questioned by some Chinese researchers for the stress it puts on children. Chinese pupils spend more time in school than British children. School days are longer and holidays are shorter. On average, under the current system, the length of the secondary school year is 245 days. Chinese pupils get around four weeks off in winter, and seven weeks in summer, including weekends and all kinds of traditional festivals. That’s a total of 175 days off, 37 days fewer than UK pupils. The obesity rate among young US children has fallen by 43% since 2003-2004, the first broad decline in years, a new national study has found. Obesity among US children ages two to five dropped to 8.4% in 2011-2012 from 13.9%, the survey found. Scientists have not identified an exact cause but say a decrease in sugary beverage consumption may contribute. Childhood obesity has been shown to increase risk of obesity, cancer, heart disease and stroke later in life. The study was conducted by the Centers for Disease Control and Prevention and published in the Journal of the American Medical Association (Jama) on Tuesday. There is a long scholarly debate on the tradeoff between research and teaching in various fields, but relatively little study of the phenomenon in law. This analysis examines the relationship between the two core academic activities at one particular school, the University of Chicago Law School, which is considered one of the most productive in legal academia. We use standard measures of scholarly productivity and teaching performance. For research, we measure the total number of publications for each professor for each year, while for teaching, we look at the average teaching rating. Net of other factors, we find that, under some specifications, research and teaching are positively correlated. In particular, we find that students’ perceptions of teaching quality rises, but at a decreasing rate, with the total amount of scholarship. We also find that certain personal characteristics correlate with productivity. The recent debate on the mission of American law schools has hinged on the assumption that a tradeoff exists between teaching and research, and this article’s analysis, although limited in various ways, casts some doubt on that assumption. One advantage to redrawing the lines is that it could delay the financial hit of having to build a new school. Some school officials are already talking referendum. Plus, with space available in the district, is there really any good reason any student should be forced to attend class in what was formerly a closet, as some at Sandburg Elementary do? More troubling is the effect crowding could have on low-income students who, statistically at least, struggle academically and might benefit from better learning environments. According to data collected by the Department of Public Instruction, 48.9 percent of Madison elementary students were considered “economically disadvantaged” last school year. For the five schools over capacity now, that percentage was 48.4. But two of those schools are more affluent and are expected to see their enrollments drop below 100 percent capacity by 2018-19. 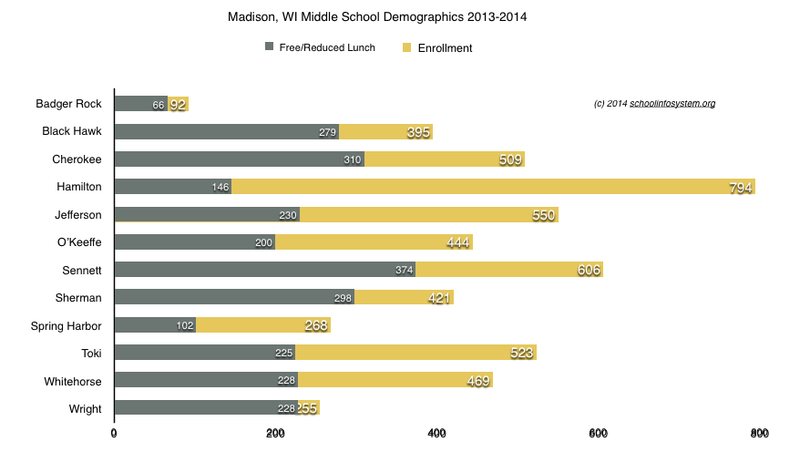 Most of the seven schools expected to be over capacity in 2018-19 serve less affluent areas of Madison, and collectively, the seven had a student population that was 57.8 percent economically disadvantaged last year. Sharing Student Data In The Cloud: Should We Be Worried? U.S. Education Secretary Arne Duncan is addressing educators in Washington today on the issue of student data — everything from attendance and health records to test scores and disciplinary data. There’s a big fight going on in many states over whether that data should be stored online and managed by third parties like inBloom, a nonprofit funded by the Bill & Melinda Gates Foundation. Inbloom declined Here & Now’s request for an interview, but we are joined by two people with very different views on this: Mary Fox-Alter, superintendent of schools in Pleasantville, N.Y., and Aimee Rogstad Guidera, executive director of the Data Quality Campaign. Parents who want Mississippi lawmakers to approve special education vouchers are adding their voices in support. House and Senate lawmakers held a hearing Tuesday to showcase the proposals. Natalie Gunnels of Tupelo told lawmakers that public school administrators can’t or won’t take care of students like her son Patrick, who has trouble walking, is sensitive to noises, and has trouble reading and writing. “It’s obvious to me and my husband that the public school system is not equipped to educate the Patricks of our state,” Gunnels said. The plan would give debit cards with more than $6,000 on them to parents who withdraw their special education students from public schools. The money could be spent on private school tuition or private tutoring services. Mandy Rogers, a disability advocate, said that the state has been promising improvements but not delivering since the federal law was passed. This week, National Education Association (NEA) president Dennis Van Roekel released an open letter to his members criticizing the implementation of the Common Core State Standards and demanding a series of “course corrections,” without which NEA will no longer back the initiative. Van Roekel joins Randi Weingarten, the president of the smaller and more urban American Federation of Teachers, in turning his back on the new standards, which were voluntarily adopted and designed to establish a more credible and consistent definition of proficiency across academic subjects. It’s worth keeping a few things in mind. February is Black History Month and we’re thinking about the critical need for more diverse educators in our state. Delaware’s public school population is 45 percent African-American and Latino and 52 percent white. Teachers of color in our state have comprised 13 percent of the teacher workforce statewide for two decades. This disparity goes far beyond optics and affects how students see themselves, what they believe is possible, and what they understand about the world outside their school buildings. Students benefit from the insights and experiences of teachers who reflect all communities in Delaware to shape the curriculum and day-to-day experiences offered in our schools. Their pre-K though grade 12 experience must prepare them to thrive in a diverse world, and to believe amazing and unstoppable things about their potential within it. This concerns all of us. Our students of color, particularly those growing up in low-income communities, lag behind their more affluent peers in early literacy, graduation rates, and college matriculation and completion. According to the Delaware Department of Education, African-American teens make up 44 percent of all dropouts, even though they make up 33 percent of the high school student population. African-American and Latino dropout rates outpace the state average by 20 percent. For too long, individual teachers’ voices have fallen on deaf ears in favor of the self-preserving agenda of the teachers unions. Focused primarily on maintaining a system of forced dues and political power, the union’s outdated model isn’t serving a profession eager to embrace the future. This is great news for higher education but bad news for higher education reformers who have been hoping that the financial crunch might cause colleges to rethink their operating assumptions. It is no small irony that faculty tend to be anti-capitalist while the financial stability of their institutions depends heavily on the stock market. Alas, no matter how much college faculty bad-mouth the 1 percent, the wealthy seem to have a soft spot for the ivory tower. A district might want to hire a registered nurse instead of a certified school nurse as required by the rules, for example. Last year, a district wanted to put a school psychologist in as a guidance. Emails sent by the Broad Foundation, a leading advocate of market-based education reform and charter expansion, and acquired through a freedom of information request, reveal that many charter management organizations consider TFA presence in a region a necessary prerequisite for opening new schools. According to the documents, charter management organizations including Rocketship, KIPP, Noble, LEARN and Uncommon Schools all indicated that a supply of TFA teachers was a general pre-condition for expanding into a new region. The emails, which detail the Broad Foundation’s failed efforts to lure high-performing charter operators to Detroit, were released as part of a trove of thousands of documents requested as part of an investigation into Michigan’s embattled Education Achievement Authority. With nearly 40 percent their students already opting out of the ISAT, teachers at Saucedo Scholastic Academy–a high-achieving magnet school–took the bold step on Tuesday of voting to refuse to administer it. In only one other instance–at a high school in Seattle last year–have teachers in one school made a unified group decision not to give a mandated test. National opponents of standardized testing applauded the decision and said it will send a signal across the country. ISAT testing is conducted for eight hours over two weeks, starting on March 3. Testing opponents have already launched a drive to urge families in CPS to “opt out” of the ISAT, which is being administered for the last time this year. Pisa stands for Programme for International Student Assessment. But judging from the reaction to the OECD rankings of educational attainment, it may as well mean Parental Index of Social Anxiety. The latest analysis of the global league table showed that the 15-year-old children of Chinese janitors and street-sweepers were better at maths than the offspring of many other countries’ professionals and managers. The news added fuel to this week’s visit to Shanghai by a UK education minister, bent on finding the secret of local children’s success and replicating it at home. But British concerns were reflected around the world, with telling local variants. Spain’s El Confidencial highlighted that Madrid’s teenagers were outperforming Catalonia’s. Corriere della Sera wondered why, against the grain of other countries, the children of Italian managers beat those of professionals, who have higher educational attainment. (If you will inherit the family law firm or accounting practice, you get lazy, suggested one OECD researcher). Nationally, the high school Class of 2012 ushered in a first wave of declines in the number of graduates, according to a report by the commission. The trend will worsen after 2025, when admissions officers face the impact of a drop in births that began with the 2007 recession. Over the next two decades, the biggest drain in graduates will be in the Midwest and Northeast. The demographic shifts are compounded by economic factors as the cost of higher education continues to rise. The bill would also prohibit the operators of those services from using or disclosing the information of students in the state for commercial purposes like marketing. It would oblige the firms to encrypt students’ data in transit and at rest, and it would require them to delete a student’s record when it is no longer needed for the purpose the school intended. Lawmakers like Mr. Steinberg are part of a growing cohort of children’s advocates who say they believe that regulation has failed to keep pace with the rapid adoption of education software and services by schools across the country. Related: Google admits data mining student emails in its free education apps. Your nominations of this particular question came in from all corners of the country–all mid-sized cities–like Louisville, New Orleans, St. Louis, Cincinnati, Baltimore, Charlotte. They came from all ages of you, from the millennials to those who wrote that a half century ago, this question was also asked in Chicago and San Francisco, when those cities were arguably more “mid-size” than they are today. You also said this was the question of Oahu (where we know the young Barack Obama of modest means attended the elite private school, Punahou) and from Melbourne, Australia. These kids should learn write from wrong. — Newly named to head Baltimore’s public schools, Gregory E. Thornton has unfinished business in the district he is leaving behind after 31/2 tumultuous years. Wearing a red T-shirt, he arrived Friday at a school where, to peals of laughter, the 59-year-old would join kids in a “jump rope-a-thon.” But, as so frequently happened during his tenure, there were political hoops to jump through first. “How are we doing?” Thornton asked a state senator he spied in the welcoming crowd. It was not so much a pleasantry as a pulse check: How are we doing, he meant, in thwarting two bills that would close public schools and sell empty facilities to private schools that accept vouchers? In a brief exchange, the senator mentioned a potentially worrisome legislator, and Thornton said he’d already talked to her the previous night. And then, it was time to “make some noise” as he exhorted the school crowd who had gathered to jump rope in honor of a phys ed teacher who started the tradition 35 years ago. It was just another day navigating the complicated terrain of Milwaukee Public Schools. As a West Point graduate and faculty member, I find many of these arguments troubling. Academy leaders and alumni have often asserted that performance on the gridiron has a direct impact on our ability to win our nation’s wars and that we therefore have a moral imperative to win in football. But the facts do not support that assertion. What Comes After the Public University? With total student loan debt over one trillion dollars, millions of students and families can never hope to repay what they owe, especially since there are no individual solutions to the problem. Student loans are not dischargeable in bankruptcy, and student loan lenders can and do garnish debtors’ wages and social security checks. The powers of lenders to collect are unprecedented in the history of creditor/debtor relations. Yet, belief in upward mobility through education is still a profoundly American ideal. In the midst of the latest recession, politicians and elites have argued not for the redistribution of wealth but for making college “more affordable” in the belief that increasing access to education makes more fundamental social changes unnecessary. Forgotten, too, in the emphasis on college financing is that education is not just a path to a job. It’s a site of human desire, aspiration, and hope for the future. As a former teacher and a student debtor, I’ve been thinking a lot about the future of higher education. And as an education activist, I’ve been coming to terms with what it means to fight for public education while mourning the death of the university. Before explaining what I mean by “the death of the university,” I will provide some details about my own political history and how it has shaped my current thinking. Madison Schools Considers School Boundaries, Might Low Income Distribution be Addressed? Board member T.J. Mertz said that sometime in the next six or seven months the board will begin a process of seriously looking at facilities issues, including whether to embark upon the contentious fix of changing any of the district’s school boundaries, among other solutions. Related: We have seen this movie before. 10 Reasons to Combine Lapham & Marquette. When Nicholas Kristof, the soft-hearted liberal on the New York Times op-ed page, decided that political scientists had given up on writing for a broader public, a digital avalanche of blog posts, letters to the editor, and tweets, followed. The APSA, Corey Robin, Claire Potter, and basically the entire editorial collective of Jacobin took the man to task for, basically, channeling the laziest version of Tom Friedman. Why, Kristof seemed to be asking, casually leafing through the past few issues of the New Yorker, can’t more people write like Jill Lepore? This is a fine question, but – as Robin points out – it isn’t the right question at all, and it probably isn’t an honest question, either. The president says this at a dinner-party in the home of his grand duke; and next morning he hurries off to argue with the recalcitrant professor. He points out the humiliating need of funds-just now when the professor’s own salary is so entirely inadequate. He begs the professor to realize the president’s own position, the crudity of business men who hold the purse-strings, and have no understanding of academic dignity. He pleads for just a little discretion, just a little time-just a little anything that will moderate the clash between greed and service, the incompatibility of hate and love. The University of California’s $11.2 billion endowment has produced the worst investment returns of any of the richest colleges in the country over the past decade, an analysis by The Center for Investigative Reporting shows. From the 2004 through 2013 fiscal years, the investment payout for the UC endowment ranked last among the 10 U.S. universities with the largest endowment funds. The university earned an average of 7.3 percent on the combined endowment of the system and individual campuses, while the other nine colleges – which include the public University of Michigan and University of Texas – averaged 10 percent. Was that a compliment, a dismissal, or both? It’s hard to say. Academic writing is a fraught and mysterious thing. If you’re an academic in a writerly discipline, such as history, English, philosophy, or political science, the most important part of your work–practically and spiritually–is writing. Many academics think of themselves, correctly, as writers. And yet a successful piece of academic prose is rarely judged so by “ordinary” standards. Ordinary writing–the kind you read for fun–seeks to delight (and, sometimes, to delight and instruct). Academic writing has a more ambiguous mission. It’s supposed to be dry but also clever; faceless but also persuasive; clear but also completist. Its deepest ambiguity has to do with audience. Academic prose is, ideally, impersonal, written by one disinterested mind for other equally disinterested minds. But, because it’s intended for a very small audience of hyper-knowledgable, mutually acquainted specialists, it’s actually among the most personal writing there is. If journalists sound friendly, that’s because they’re writing for strangers. With academics, it’s the reverse. Imagine meeting someone who says she works at a university. Some years ago, it would have been fairly safe to assume that she was a professor, and a member of the middle class with enviable job security. Not anymore. Two reports make clear that the nature of the college work force has changed substantially, possibly to the detriment of educational quality. As a rule, adjuncts have few or no benefits. They are generally paid per course, and paid poorly. (The Coalition on the Academic Workforce estimates that the median pay for a standard three-credit course is $2,700.) Because adjuncts often teach several classes in order to cobble together a living, they have little time for the research necessary to advance their careers. The following links provide a lot of additional details on the legislation that would replace the Common Core State Standards within 12 months with model academic standards created in Wisconsin. Please stay informed and contact your legislators with your thoughts. Video message from Wisconsin Department of Public Instruction Tony Evers. Governor Scott Walker staff drafted bill aimed at Common Core State Standards. A Critique of the Wisconsin DPI and Proposed School Choice Changes. College endowments totaled $448.6 billion in the fiscal year ended June 30, 2013, an increase of 11.7 percent compared with a year earlier, according to recently released data. As we know, this wealth is concentrated among a privileged few. Harvard, Yale and Princeton universities all have almost $2 million in endowment funds for every student. We’ve heard the argument that what these institutions do with their privately raised money is their business and that they provide a lot of financial aid opportunities for less affluent students. But these endowments are of dubious value and can be attacked on two grounds. First, they promote inefficiency through misallocation of resources. Second, they are anti-meritocratic. “One of the admissions counselors walked up to me, and said, ‘Diallo, did you see yourself in the admissions booklet? Actually, you’re on the cover this year,’ ” Shabazz says. “So I flipped back, and that’s when I saw my head cut off and kind of pasted onto the front cover of the admissions booklet,” he says. IF THE world’s education systems have a common focus, it is to turn out school-leavers who are proficient in mathematics. Governments are impressed by evidence from the World Bank and others that better maths results raises GDP and incomes. That, together with the soul-searching provoked by the cross-country PISA comparisons of 15-year-olds’ mathematical attainment produced by the OECD, a club of mostly rich countries, is prompting educators in many places to look afresh at what maths to teach, and how to teach it. Those countries languishing in the league tables fret about how to catch up without turning students off the subject with boring drill. Top performers, most of them Asian (see chart), fear that their focus on technical proficiency does not translate into an enthusiasm for maths after leaving school. And everyone worries about how to prepare pupils for a jobs market that will reward creative thinking ever more highly. Maths education has been a battlefield before: the American “math wars” of the 1980s pitted traditionalists, who emphasised fluency in pen-and-paper calculations, against reformers led by the country’s biggest teaching lobby, who put real-world problem-solving, often with the help of calculators, at the centre of the curriculum. A backlash followed as parents and academics worried that the “new math” left pupils ill-prepared for university courses in mathematics and the sciences. But as many countries have since found, training pupils to ace exams is not the same as equipping them to use their hard-won knowledge in work and life. A few years ago, “Carmen”, a 17-year-old Latino girl in Boston, split up with her boyfriend. She wanted to tell her friends how upset she felt and duly put a post on her Facebook page. But there was a problem. Carmen’s mother (like, I daresay, many FT readers) monitored her daughter’s Facebook page – and Carmen did not want to tell her about the break-up. So, to signal her loss to her friends, she posted a message with the Monty Python song “Always Look on the Bright Side of Life”. Her mother thought this meant Carmen was happy: her friends, however, understood that Carmen was using private teen code, since they often communicated with songs. They started a conversation with text messages – away from her mother’s eyes. Carmen had thus maintained her “privacy”, even on a public space. Just a trivial example of teenage behaviour? Danah Boyd, a digital anthropologist who now works at Microsoft Research, does not think so. She has spent the past decade analysing how teenagers use social media by watching the subtle cultural signals, rituals and group dynamics that a more traditional anthropologist might track in an Amazonian village or “tribal” Papua New Guinea. And after conducting extensive research in 18 states across the US, she argues in a new book, It’s Complicated, that some of the received wisdom about social media is wrong. Teenagers are not being corrupted by Facebook and Twitter, as (adult) pundits often fear. Instead, they are developing adaptive skills for this new digital age. As a result, the kids are (mostly) “all right”, she insists, even if their behaviour occasionally baffles adults. 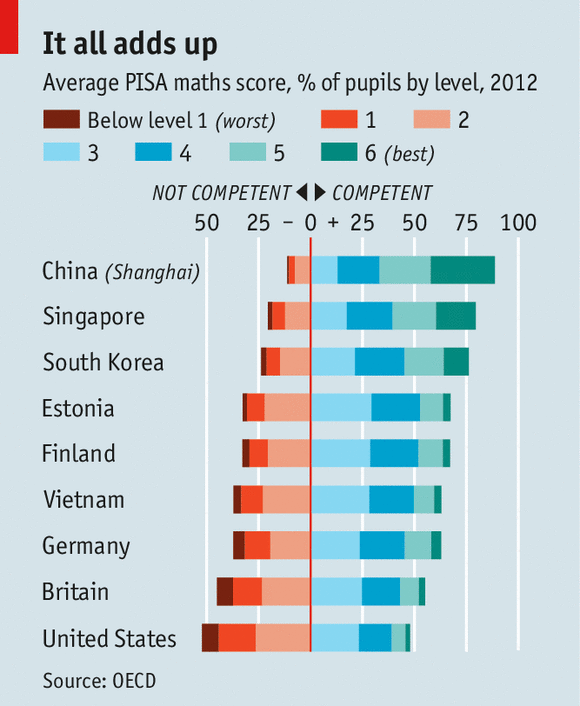 Students in Shanghai have the highest results in international Pisa tests. But what is the state of education for China’s rural poor, far away from the showcase cities? Andreas Schleicher, who runs the Pisa tests, went to find out. About 1,900 miles south west of Shanghai is Qiao Tou Lian He elementary school. It’s an hour’s drive from the town of Tengchong, which might seem a small distance in comparison, but most of the school’s children have never made it to Tengchong. Providing an education for children in such sparsely-populated rural areas is one of China’s major challenges. While the economic and social development of these rural regions has been remarkable, China’s coastal cities are racing ahead at an even faster pace. The children of cleaners in Asian cities such as Shanghai and Singapore are better at maths than the offspring of doctors and lawyers in the US and UK, according to an analysis of the global Pisa test rankings published on Tuesday. The international league table, first released by the OECD in December, had shown 15-year-olds in Shanghai to be top in maths, while the UK languished in 26th place and the US in 36th. But fresh scrutiny has revealed that the state-educated children of British professionals are on average a whole school year behind the children of “elementary” workers in Shanghai in maths ability, and around three months behind the same group in Singapore. The gap is even wider between US professionals and Asian cleaners or caterers. The desire to “jump ship” is further compounded by the terribly poor pay for post-docs and grad students. Most of our pay is set nationally by the NIH and is not adjusted for cost-of-living differences, which means that NIH-funded post-docs in San Francisco (with a median rent of $1363/mo) get paid the same as post-docs in Iowa City (with a median rent of $734/mo). After however many years of education for a PhD my UCSF take-home pay after federal and state taxes, etc. is about $2800/mo. I’m a father; if I wanted to use UCSF daycare and live in UCSF post-doc housing I would be paying $1998/mo for daycare and at least $1099/mo for a studio. Imagine if I was a single parent? This would make my net take-home pay negative $297/mo. 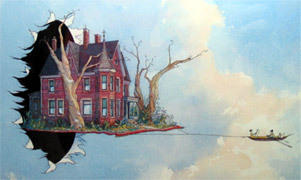 When he was 4 years old, he took apart his mother’s dining room table and gliding ottoman. Last year, he built a computer, pretty much from scratch. Spend a little time Googling and you can quickly come up with names of famous people who switched careers in mid-stream. Julia Child, for example, worked in intelligence for the U.S. government before transitioning to cookbook author and television chef. Harrison Ford was a carpenter before he made it big in acting. And Peter Mansbridge worked as a baggage handler (and sometime flight announcer) at the Churchill, Manitoba, airport before starting a successful career in broadcast journalism. But switching disciplines mid-stream in academia? It is a risky move that requires self-confidence and the ability to both see and seize opportunities. One would think an academic career switch is fairly rare, and yet it wasn’t hard to find several Canadians who’ve done it and thrived. Christine Xue wants to be an architect. Her mother, who runs a financial services business in their home region of Chengdu, southwest China, does not share this ambition for her daughter. She would rather her only child opted for something altogether more secure – accountancy, perhaps, or maybe banking. So the 17-year-old is resigned to studying physics at university in order to appease her parents. Secretly, however, she harbours hopes that one person may be able to bring her parents round to architecture: her guardian, Ophelia Colley. The well-groomed Ms Colley, 33, helps her young charge navigate the mysteries of the British education system, translates school reports for her parents and is on hand to support Ms Xue through the loneliness of living far away from home while studying at Queen Margaret’s School in the desolate Yorkshire countryside. The girls’ boarding school, on the grounds of a former Georgian estate, is beautifully elegant but on an icy-cold, rain-soaked day like today, it looks rather sombre and grey. Ms Colley, originally from Hong Kong, sees her role as an advocate for her mainland Chinese and Hong Kong teenagers, not just liaising with the school but also the parents. It is her duty, she says, to educate the parents in western ways, telling them they need to adopt a new perspective. For parents rooted in Chinese culture and traditions, it can be difficult to understand their child’s outlook infused with western experiences. AMERICANS are deeply divided as to whether widening inequality is a problem, let alone what the government should do about it. Some are appalled that Bill Gates has so much money; others say good luck to him. But nearly everyone agrees that declining social mobility is a bad thing. Barack Obama’s state-of-the-union speech on January 28th dwelt on how America’s “ladders of opportunity” were failing (see article). Paul Ryan and Marco Rubio, two leading Republicans, recently gave speeches decrying social immobility and demanding more effort to ensure poor people who work hard can better their lot. Just as the two sides have found something to agree on, however, a new study suggests the conventional wisdom may be wrong. Despite huge increases in inequality, America may be no less mobile a society than it was 40 years ago. The study, by a clutch of economists at Harvard University and the University of California, Berkeley, is far bigger than any previous effort to measure social mobility. The economists crunch numbers from over 40m tax returns of people born between 1971 and 1993 (with all identifying information removed). They focus on mobility between generations and use several ways to measure it, including the correlation of parents’ and children’s income, and the odds that a child born into the bottom fifth of the income distribution will climb all the way up to the top fifth. Following the general wisdom that says, “Leave well enough alone,” let’s not mess with the basic structure that supports the Wisconsin Technical College System (WCTS). Gov. Walker and the Republican legislature have opened the subject by proposing a property tax cut of more than $400 million through the mechanism of reducing the property tax raised annually for the technical colleges. Note, though, that this return of a projected windfall budget surplus through that channel is a one-time deal. It is not a permanent change to the tax structure that supports the 16 the colleges. Funding two of our major educational institutions, K-12 and the University of Wisconsin, has been stressful to say the least over the last decade. It will be a major issue in the campaign for governor this year. The funding crunch stems from the fall-off in state tax revenues during the Great Recession and the grudging recovery. Further, Medicaid has chewed up much of the meager growth in the state’s sales and income taxes. That under-managed program is crowding out many other priorities, even though the feds pay 60% of the tab. As I’ve already described, I’m worried about the oncoming MOOC revolution and its effect on math research. To say it plainly, I think there will be major cuts in professional math jobs starting very soon, and I’ve even started to discourage young people from their plans to become math professors. I’d like to start up a conversation – with the public, but starting in the mathematical community – about mathematics research funding and why it’s important. I’d like to argue for math research as a public good which deserves to be publicly funded. But although I’m sure that we need to make that case, the more I think about it the less sure I am how to make that case. I’d like your help. So remember, we’re making the case that continuing math research is a good idea for our society, and we should put up some money towards it, even though we have competing needs to fund other stuff too. So it’s not enough to talk about how arithmetic helps people balance their checkbooks, say, since arithmetic is already widely known and not a topic of research. Related: “Anonymous” On The Battle Of Chattanooga. .To make matters worse, I’ve met one of the co-authors of those words. Louis Hyman teaches at Cornell, his books on the history of debt are excellent and if I had all the time in the world I’d be taking his upcoming MOOC on the history of capitalism just for the sheer enjoyment of it. I’ll bet you anything that he’s a terrific lecturer, but if you think I’d let him or anybody else replace my own content on any subject you’ve got another thing coming. I’m funny about people misspelling my last name. I think if it were, say, “Pryzbylewski” I wouldn’t get upset about it. That’s a hard name to spell, but “Matthew” is easy. Yet people add an “s” on the end all the time–telemarketers, doctors, Verizon, restaurant hostesses, and students. In the classroom, I can tell myself that I get persnickety about it because I’m teaching my students to pay attention to details, but I suspect I’m just funny about my name. And, when I’m at school, I’m funny about my title. Outside of work I rarely use it. In fact, when people ask me what I do for a living I just tell them I teach instead of saying I’m a university professor. But at school I assume that, like my male colleagues, students will refer to me as Dr. or Professor instead of Miss or Mrs. Depending on my mood or the time of the semester, I am either good-natured or sarcastic about this mistake. Early in the term I might say, “I may be large and contain multitudes but I am also singular, so please note there is no “s” at the end of my name,” or I try to keep it simple by saying “that’s Matthew two t’s no s.” When students (and when the mistake is made it’s almost always a male student making the mistake) call me Miss or Mrs., I’m neither good-natured nor sarcastic. That’s a mistake of a different kind. I try not to be too aggressive scary-feminist about the whole thing, but I’m quick to point out the error. Neither of these are high on my list of the problems of a tenured academic, but a recent comment on a student evaluation reminds of how being read as “black” by students has shaped my teaching, for better or ill. Put a child of a cleaner from Shanghai or Singapore up against a scion of the western elite in a standardised test and guess who will come out top? According to the latest research, the western kids will trail their Asian counterparts by the equivalent of a whole school year. This prompted another bout of anxiety of a kind that has become increasingly common since 2001, when the global Pisa survey of educational attainment was first published. Parents once drew comfort from steady improvements in school-leaving grades in places such as the UK. Confronted with evidence of how their children’s accomplishments compared to those of students in faraway places, many westerners have taken fright. Next week Elizabeth Truss, a British education minister, will lead a fact-finding mission to Shanghai to try to find out what the schools there are doing right. Yet in their rush to copy the winning formula of high-performing countries in east Asia, politicians risk drawing the wrong conclusions. Schools in Shanghai are very different from those in Ms Truss’s constituency in southwest Norfolk. But not all of those differences play a role in Shanghai’s superior performance. Some are irrelevant. Some may even be harmful. And some will be idiosyncratic features of the school she happens to visit, rather than representative of the system. It is easy to point out how a good school differs from a bad one, and conclude that you have found the secret to high achievement – but it is also lazy, unscientific and wrong. Thirty-four pages of research, branded with a staid title and rife with complicated graphs, might not seem like a scintillating read, but there’s no doubt that a report released on Wednesday will punch higher education’s hot buttons in a big way. The report, “Labor Intensive or Labor Expensive: Changing Staffing and Compensation Patterns in Higher Education,” says that new administrative positions–particularly in student services–drove a 28-percent expansion of the higher-ed work force from 2000 to 2012. The report was released by the Delta Cost Project, a nonprofit, nonpartisan social-science organization whose researchers analyze college finances. $5,785 may not do much for you at Duke where tuition exceeds $50,000 a year. But, it can put a serious dent in the tuition at Durham Tech Community College (approx. $13,000). With some state aid, institutional aid, and some luck a student might be able to get some of that workforce training everyone from the President of the United States and all the captains of the private sector claim we need. Pell grants help poor students overcome the consequences of choosing to be born to parents without means. For almost the entire history of higher education in this country, college was for the sons (and much later the daughters) of wealthy families. The GI Bill created a national model for distributing aid to students without the benefit of inter-generational wealth to go to college. But, the GI Bill was not evenly or fairly distributed. Despite the disproportionate number of black men and women who served in the military two decades after it was integrated, black folks had a hard time getting the aid they’d been promised. The streets of Portland resemble those of Madison in 2011, only in Portland it is the Board of Education’s failure to bargain in good faith which is causing the labor dispute. “Fighting for the Schools Portland Students Deserve” is a predominant sign. This refers to the School Board’s failure to implement an Arbitrator’s Award which would provide additional planning time and reduce class size to provide more time for teachers to work with students and their individual learning styles; individual differences. The District has nearly $30 million it could access to address the issues presented by the Portland Association of Teachers, but the Board refuses. Instead the Board of Education threatens to take away the early retirement (TERP) benefit, even though it saves the District significant money. Among other issues are just cause and due process standards, videotaping instruction for evaluative purposes and the District improperly using “letters of expectation” to bully teachers. The Union plans to strike if Contract issues are not resolved by February 20. The old iron key turns on the third attempt and 50-year-old Wu Yuemeng pushes the door open with her knee. She motions her daughter into a seldom-used upstairs bedroom that is dominated by a dusty, century-old wooden loom and a metal-banded chest. Wu reaches into the chest and takes out treasures, as her daughter – the cheerful 19-year-old Xia – looks on. She pulls out hand-woven shoes, finely embroidered silk ribbons and fabrics dyed with intriguing patterns – all of which are ethnic Dong costumes and accessories. Finally, she reveals the prize: a glittering ceremonial headpiece with swaying golden leaves (see magazine cover) that has been passed down by generations of mothers to their daughters. Layer by layer, lace by lace, Wu drapes her daughter in the garments she began making while pregnant with Xia, before she knew her baby would be a girl, let alone what kind of girl she would grow up to be. After Xia was born, Wu continued to weave and embroider ribbons and shirts whenever she was not in the fields planting rice. Dong women embroider with just a single needle and without a fixed pattern, using their stitches to express their feelings for their children. The Dong people of impoverished Guizhou province have no written language, but their textile craftsmanship is unmatched in its refinement, and is a clear communication of love. New York City is worth watching these days as Mayor Bill de Blasio begins his new “progressive” government. His first priority seems to be a political and economic assault on charter schools. The number of charters in New York City grew by over 900% under former Mayor Michael Bloomberg and they now teach some 70,000 kids out of 1.1 million. Stanford University’s Center for Research on Education Outcomes has twice found that the city’s charter students do better in reading and math than their counterparts at district schools. Manhattan Institute senior fellow Stephen Eide on why forcing New York City charter schools to pay rent will impact educational outcomes. Photo credit: Associated Press. Mr. de Blasio plans to redress this inequity by handicapping charters. His Department of Education has already zeroed out $210 million in funding from its 2015-2019 capital budget for charter construction. The new mayor has also announced a moratorium on co-locations, a policy that allows charters to share facilities with district schools and provides for a more efficient use of space. Twenty-five co-locations approved last year under Mr. Bloomberg may be in jeopardy. Mr. de Blasio explains that kids in district schools may feel like they’re getting an inferior education if a charter moves in next door and renovates. Charters are public schools that also raise private money, and state law requires the city to match the private funds on district schools that charters spend on upgrades to prevent a disparity. So by killing co-location Mr. de Blasio can also spend less on district schools. The advances we’ve seen in the past few years–cars that drive themselves, useful humanoid robots, speech recognition and synthesis systems, 3D printers, Jeopardy!-champion computers–are not the crowning achievements of the computer era. They’re the warm-up acts. As we move deeper into the second machine age we’ll see more and more such wonders, and they’ll become more and more impressive. Computer science is mostly white or Asian and male. We have lots of data to support that. What I didn’t realize was how sub-groups within Asian-American differ markedly in their educational attainment. A new report from NYU and ETS disaggregates the data, and below is the startling graphic that Rick Adrion pointed me to. U.S. Supreme Court Justice Antonin Scalia accused American schools of failing to properly educate citizens in their civic duties, railed against the state favoring non-religion over religion and even took a swipe at Chicago style pizza. Scalia spoke Friday night at the Union League Club of Chicago’s 126th annual George Washington’s Birthday celebration. Calling the founder of our country “my favorite president,” and “a man of conscience and steadfast determination,” Scalia then launched into an analysis of how the founding fathers and leading teachers of the period viewed education and how far he believes educators, like courts have strayed from their original intentions. All 870 students at Hillview Middle School in Menlo Park, Calif. will soon have school-issued iPads that they can use both at school and at home. The school has slowly rolled out the program over the past three years, trying to work out the kinks before issuing the expensive devices to every student. Before students can take the devices home, they’ll have to take a course to get their “digital driver license,” which includes digital citizenship and learning their way around the device. Eighth grade students at Hillview have had their iPads since the beginning of the school year. Read more on how teachers are using the devices in class so far and their hopes for the future. Here, they weigh in on how the devices change what happens in class, how they think about learning and how they organize their school work. I am a current high school senior who intends to go into the software industry. I’m trying to decide between enrolling in college to pursue a BS in Computer Science or entering directly into the workforce. My conundrum is this: I intend to seek a front-end engineering job, and am already very competent in front-end technologies. I have a fair number of items on my resume, mostly from personal projects and internships. I anticipate being able to acquire a moderately well-paying ($60,000 to $80,000+) development job after leaving high school. However, I’m also worried that not pursuing a degree will exclude me from certain well-paying jobs, especially later in my career. I’m also quite worried about the debt load that a degree would require. I anticipate having to take out between $50,000 and $100,000 in loans to finance a degree. Is standardized testing anti-student? Many educators and commentators believe so, vehemently. No more “drill and kill,” some detractors demand. Kids are not robots goes another refrain. Others argue that standardized testing is a soul-sapping exercise in rote learning that devalues critical thinking and favors students of higher-income parents who can afford test-prep classes or private tutors. On the contrary: Testing is good for the intellectual health of students. It is also an excellent way for teachers to better understand the particular academic challenges their students face. First, standardized tests are a critical thinker’s dream. Multiple-choice questions often ask students to evaluate evidence and make inferences. Consider a sample multiple-choice question for the New York State English Language Arts test, which is administered in the public schools. It asks students to identify the tone of a paragraph excerpted from Andrew Carnegie’s “The Gospel of Wealth” (1889). By the time this post appears, the first peer-graded assignment in Cathy Davidson’s Coursera MOOC, “History and Future of (Mostly) Higher Education,” will have come and gone, and students will be well into the second. Unlike programming projects, algebra exercises, and multiple-choice questions that can all be reliably graded by a computer, Coursera offloads the task of evaluating essays to students. After the deadline for an assignment has passed, students have a week to evaluate five of their classmates’ essays using a rubric developed by the teaching staff. A student who fails to evaluate his or her classmates does not get a grade for the assignment, and in our course will not be able to achieve the statement of accomplishment “with distinction.” Whether students see that as a chore, duty, or opportunity, the necessary assessment is eventually done–for better or for worse. Peer grading can be a controversial proposition. When students’ scholarships and internships are riding on their grades, it isn’t surprising that they hesitate to allow their classmates–who know as much as they do about the course material–to have any effect on their final assessment. Instructors scoff at the idea that students can be left to evaluate one another, certain that they will collude so that everyone will receive an A without doing any of the work. In its worst incarnation, peer grading can be a scheme for lazy professors to offload on students the boring work of assessment. Let’s look at the characteristics of the Bell Curve, and I think you’ll quickly understand why the model doesn’t fit. Technology makes wealth inequality worse by giving people leverage and compounding differences in ability and amount of work. It also often replaces human jobs with machines. A long time ago, differences in ability and work ethic had a linear effect on wealth; now it’s exponential. Technology leads to increasing wealth inequality for lots of other reasons, too–for example, it makes it much easier to reach large audiences all at once, and a great product can be sold immediately worldwide instead of in just one area. Without intervention, technology will probably lead to an untenable disparity–so we probably need some amount of intervention. Technology also increases the total wealth in a way that mostly benefits everyone, but at some point the disparity just feels so unfair it doesn’t matter. Public trust in the government, already quite low, has edged even lower in a survey conducted just before the Oct. 16 agreement to end the government shutdown and raise the debt ceiling. Last week we highlighted a study showing that university administrative positions rose 28 percent in the last decade, but a new study from the NECIR suggests that the problem is even worse. Over the last 25 years the number of administrative employees at U.S. colleges and universities more than doubled, according to a joint study by the New England Center of Investigative Reporting and the American Institutes for Research. The ratio of nonacademic positions to faculty positions doubled at both public and private institutions. Overall, the industry has added an average of 87 administrative positions per day, a rate has scarcely slowed since the economic downturn, despite tuition increases. Even more surprising, academic institutions have added more administrative employees despite part-time faculty taking on more teaching duties than full-time professors. I decided that it would be a bit easier to digest to do the chart by individual subjects and use points rather than percentages of a standard deviation and combined tests as an axis. Also revenue per pupil was easier to find than expenditures. 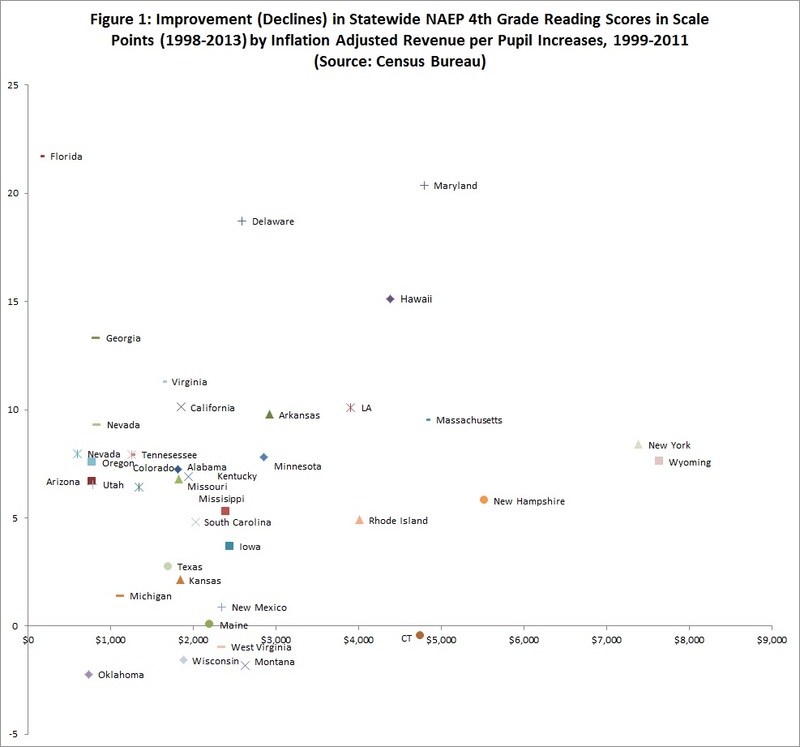 So what you see up there is a first crack at 4th grade reading between 1998 and 2013. No shock- money is still not the answer (yes I am looking right at you New York and Wyoming). Note Wisconsin’s spending growth combined with much lower than average academic performance. Daifailluh al-Bugami was just a year old when his parents noticed that his lips turned blue as he slept at night. It was his weight, doctors said, putting pressure on his delicate airways. Now Daifailluh is 3, and at 61 pounds he is nearly double the typical weight of a child his age. So the Bugamis are planning the once unthinkable: To have their toddler undergo bariatric surgery to permanently remove part of his stomach in hopes of reducing his appetite and staving off a lifetime of health problems. That such a young child would be considered for weight-loss surgery–something U.S. surgeons generally won’t do–underscores the growing health crisis here and elsewhere in the Middle East. Widespread access to unhealthy foods, coupled with sedentary behavior brought on by wealth and the absence of a dieting and exercise culture, have caused obesity levels in Saudi Arabia and many other Gulf states to approach or even exceed those in Western countries. Martius Bautista’s goal heading into the Madison All-City Spelling Bee, was a simple one. “Just try my best,” said Martius, a fourth-grader at Edgewood Campus School. His best turned out to be even better than the best. In capturing the trophy at the Mitby Theatre of Madison Area Technical College, Martius had to outduel two-time All-City champion and reigning Badger State champion Aisha Khan, an eighth-grader at Spring Harbor Middle School. Those two emerged as the finalists after Marissa Stewart, a seventh-grader at Black Hawk Middle School bowed out in the 24th round. Aisha and Martius each got their first seven words in the finals correct before Aisha was confronted with “bolivar,” the currency of Venezuela. I hear from many experienced teachers who feel the emphasis on student test results has hurt their profession. But to young people coming into the profession, the situation does not look so dark. Education leaders influenced by European and Asian methods are raising standards for those who can enroll in teacher training, while making the training deeper, with more participation by skilled veterans. Many more teachers are required now to earn degrees in their subjects. The Council for the Accreditation of Educator Preparation has set new standards for teacher training programs in which entrants should have a collective college grade-point average of at least 3.0 and college admission test scores above the national average by 2017. The higher targets might already be having an effect. An article in the quarterly journal Education Next by Dan Goldhaber, a former Alexandria School Board member, and Joe Walch, both of the Center for Education Data & Research at the University of Washington, says new teachers have significantly higher SAT scores than in previous years. Average SAT performance of first-year teachers in 2008-2009 was at the 50th percentile, compared with the 45th percentile in 1993-1994 and 42nd percentile in 2000-2001. In the past, teacher candidates had lower SAT scores than college classmates choosing other jobs, but in 2008-2009, “graduates entering the teaching profession . . . had average SAT scores that slightly exceeded average scores of their peers entering other occupations,” the researchers said. In February 2011 the Pathways to Prosperity Project at the Harvard Graduate School of Education (HGSE) released a report challenging our excessive focus on the four-year college pathway, arguing that we need to create additional pathways that combine rigorous academics with strong technical education to equip the majority of young people with the skills and credentials to succeed in our increasingly challenging labor market. Pathways to Prosperity: Meeting the Challenge of Preparing Young Americans for the 21st Century hit a nerve with employers, educators, and state officials struggling with high unemployment rates, perceived skills mismatches, and the devastating effect of the financial crisis on young people. Via the website. Much more here, here and here. For several months running, the Bill and Eva Show has been the talk of New York City politics. He is the new mayor, Bill de Blasio, an unapologetic old-school liberal Democrat, scourge of the rich and of public charter schools. She is Eva Moskowitz, fellow Democrat and educational-reform champion who runs the city’s largest charter network. How did Ms. Moskowitz, a hero to thousands of New Yorkers of modest means whose children have been able to get a better education than their local public schools offered, end up becoming public enemy No. 1? She is the city’s most prominent, and vocal, advocate for charter schools, and therefore a threat to the powerful teachers union that had been counting the days until the de Blasio administration took over last month from the charter-friendly Mayor Michael Bloomberg. Assailed by Mayor de Blasio and union leaders, Ms. Moskowitz is fighting back with typically sharp elbows. As she reminds every audience, the 6,700 students at her 22 Success Academy Charter Schools are overwhelmingly from poor, minority families and scored in the top 1% in math and top 7% in English on the most recent state test. Four in five charters in the city outperformed comparable schools. At SafeGov.org our work has long focused on the risks of allowing targeted online advertising into schools. This issue has come to the fore as companies like Google and Microsoft have launched a worldwide race to introduce their web application suites into as many schools as possible. In this article we review the background of this debate and then present important new evidence regarding the practices of one of the leading players, Google. The suites in question are known as Google Apps for Education and Office 365 Education, respectively, and they include basic apps such as email, word processing, spreadsheets, live document sharing, simple web forms and messaging. Their key selling point is that they offer students something almost as good as a traditional office suite in the convenient format of a browser window, and – best of all for cash-strapped schools – they do so at no cost. Of course as the economist said there is no such thing as a free lunch, and we must look carefully at the business motives behind these firms’ generosity. Here an important difference between the two leaders emerges. Both Google and Microsoft generate substantial revenues by selling online office suites to government and enterprises for annual subscription fees. If the firms offer essentially the same suites to schools for free, it is surely in part because they hope that when students move into the workplace they will demand the same online tools they learned to use in school. This is a business model that is honest about its intentions and serves the interests of both students and the firms. However, there is an additional component in the Google business model that involves advertising, and this is where the trouble begins. That means students will progress through in-person, online and hybrid degree programs by demonstrating that they are proficient in required concepts, which faculty members will work to develop. Schott said the university will start by converting general education requirements, and then move to majors. Say you wake up at 8 am. You shower, eat breakfast, brush your teeth… and get to work at 9. You spend your day working, leave the office at 5, and get home at about 5:30. You unwind a for a few minutes, and then start making dinner. By the time you’re done cooking, eating and cleaning, it’s 7 o’clock. You want to make sure that you get in your daily exercise, but you need to digest first, so after watching TV for a half hour, you start your workout. An hour later, it’s 8:30. And after showering, it’s 8:45. You now have about 3 hours before you go to sleep and start your day over again. Your career is very important. Aside from routine daily activities, the majority of your day will be work. That big 8 hour chunk. 9-to-5. And since this will be true for, say, 50 years, I don’t think that it’d be too much of a stretch to say that the majority of your life will be work. For this reason, I think that it’d be wise to give this decision the time and thought that it deserves. When you ask people, “What do you want to do with your life?”, I don’t think that they give you an honest answer. I don’t think they’re trying to deceive you, but I think that they’re answering a different question. The question that they hear is, “Given that I’ll be busy from 9-5 every weekday for 50 years, what else would I like to fit in to my life?”. The champions of massive open online courses, or MOOCs, and other digitally mediated mass-produced education often speak of the “necessity” of transitioning to this model because of all of the increasingly onerous expense of traditional higher ed and unmet demand for education. Clay Shirky believes the need is dire: “The reason to bet on the spread of large-scale low-cost education isn’t the increased supply of new technologies. It’s the massive demand for education, which our existing institutions are increasingly unable to handle. That demand will go somewhere.” (It’s worth noting that Shirky said close to the opposite of this in 2012, before the limitations of MOOCs became so readily apparent). I don’t mean to pick on Shirky specifically–I’ve done that already. His post is just the freshest example of an attitude that’s widely shared by important people like Bill Gates, Coursera founder Daphne Koller, and Udacity’s Sebastian Thrun, not to mention the venture capitalist community that fuels this industry with their investment dollars. Marc Andreesen believes that software is eating the world. It’s a very visceral image, and in one sense it’s absolutely true. Software is spreading into every industry, changing how established players must play and even what the rules of the game are. But while many in Silicon Valley and Educational Technology think that software will “eat” teachers, replacing many of them, at trinket we believe software’s role is to create openness, making teachers better and more connected. Far from there being less teachers in the future, we think openness will enable and encourage more people than ever to teach. After the heat, will Common Core standards shed light? The Common Core standards call for fifth graders to understand metaphors. So here’s a story from my life last week that I fear may end up being a metaphor for the Common Core campaign. I had a flat tire. AAA came promptly, put on that weird little spare in my trunk, and didn’t charge me anything. It turned out there was a nail in the tread. The tire was repaired and put back on my car. In a pleasant surprise, I didn’t have to pay for the repair because the tire was under warranty. I was quite pleased to have this fixed for free. But then I thought how I really had paid, both with my AAA dues and with the money the tire cost me. Furthermore, I realized things had been returned only to where they started — I had the same tire on the car and nothing was actually any different than before I ran over the nail. Are you paying attention, fifth graders? Here’s the metaphor: The tire episode was a fair amount of hassle, it’s over now, I dealt with it, but nothing was really better in the end. Is this where we’re headed with the Common Core? A lot of work for the same results? A few months ago I took a short holiday with my two daughters on Dartmoor. True to (British) form, it drizzled – constantly. So I braced myself for battles about how much television the girls could watch, or how many games they could play on my phone. But then fate – or a brilliant piece of innovation – intervened. The hotel where we were staying, Bovey Castle, featured a “Lego room service” menu, next to the normal food menu, which allowed guests to borrow Lego sets. My daughters dialled for some kits. Three days later, the room was full of models, including a highly complex “Lone Ranger silver mine”, that featured crankshafts, pulleys and fiddly little buckets. My daughters brimmed with pride. Best of all, they barely watched any Disney Channel or minded the rain. Is there a bigger moral here? I would love to think so. Last weekend The Lego Movie opened in North America and parts of Europe, to rapturous reviews and packed cinemas, earning some $69m in the first weekend alone. Having seen the movie, however, I was not entirely dazzled. It is striking to see that much Lego on a screen – the film features no fewer than 3,863,484 Lego bricks. It is also heartening to see an eight-decade-old Danish company reinvent itself, after earlier bouts of decline, by finding new focus buying intellectual property (hence the appearance of Batman Lego, Star Wars Lego and so on). But compared with some of the other brilliantly witty kids’ films, the dialogue seems clunky. So does the predictably feel-good message (that kids need to be resilient, ambitious and let their creative spirits fly). Here I attempt to write the abstract for my thesis, ‘A Partially-automated Approach to the Assessment of Mathematics in Higher Education’, “using only the ten hundred words people use the most often”. Katie Steckles pointed out via the latest Carnival of Mathematics that quantum computer scientist Scott Aaronson posted an explanation of his research using only the 1000 most common words in English, inspired by the xkcd comic ‘Up-Goer Five’, which did the same for a labelled diagram of the Saturn V rocket (the ‘Up-Goer Five’). Scott’s post links to The Up-Goer Five text editor, a fabulous innovation that allows typing in a box and highlights when a word isn’t on the same list of words used in the xkcd diagram. I used this to write a version of my thesis abstract. Beyond what the text editor wanted, I also voluntarily adjusted some terms that are on the list, but presumably not in the way I mean them. Particularly, ‘deep learning’ and ‘open-ended questions’ didn’t get highlighted. I’ve gone for a fairly close, word-by-word translation, though clearly some parts could be rewritten completely to be clearer. My thesis abstract (the version I handed in) is in a previous blog post, if you want to view it for comparison. Here’s my Up-Goer Five version. UNIVERSITIES have not changed much since students first gathered in Oxford and Bologna in the 11th century. Teaching has been constrained by technology. Until recently a student needed to be in a lecture hall to hear the professor or around a table to debate with fellow students. Innovation is eliminating those constraints, however, and bringing sweeping change to higher education. Online learning takes many forms. Wikipedia, a user-generated online encyclopedia, contains wonderfully detailed explanations. YouTube offers instruction on how to boil an egg as well as lectures on cosmology. Within many universities the online is displacing the offline. Professors publish course materials and videos of their lectures on the web. Students interact with each other and submit assignments by e-mail. Even those living on university campuses may nonetheless learn largely online, skipping lectures and reporting only for the final exam. In America, bowing to the inevitable, universities have joined various startups in the rush to provide stand-alone instruction online, through Massive Open Online Courses, or MOOCs. Though much experimentation lies ahead, economics can shed light on how the market for higher education may change. Two big forces underpin a university’s costs. The first is the need for physical proximity. Adding students is expensive–they require more buildings and instructors–and so a university’s marginal cost of production is high. That means that even in a competitive market, where price converges towards marginal cost, modern education is dear. Are education funds being wasted? We’re professionals from different backgrounds: one a Democrat and education reformer, the other a Republican comptroller of public accounts for Texas. We may not agree on everything, but we are coming together around two common beliefs. We both believe that nothing is more important to America’s economic future than a world-class public education system. We also believe that limited education dollars should be invested in proven programs that benefit kids, not in unnecessary administration, overhead or red tape. Today we’re spending more than $600 billion a year in public schools across the country, and few of us are happy with the results. Over the last five decades, in fact, U.S. education spending has skyrocketed by 350%, yet achievement levels have remained stagnant. It turns out it’s hard to search just for children’s books, and picture books, in library catalogues, but I combed through various electronic library resources, as well as Amazon, eBay, LibraryThing, and Abe, to dig up source material. I began to obsessively search the bookshelves of kids books in friend’s houses, and doctors and dentist and hospital waiting rooms, whilst also keeping on the look out on our regular visits to our local library: often academics appear in books without being named in the title, so dont turn up easily via electronic searches. Parking my finds on a devoted Tumblr which was shared on social media, friends, family members, and total strangers tweeted, facebooked, and emailed me to suggest additions. People sidled up to me after invited guest lectures to whisper “I have a good professor for you…” Two years on, I’ve no doubt still not found all of the possible candidates, but new finds in my source material are becoming less frequent. 101 books (or individual books from a series*) and 108 academics, and a few specific mentions of university architecture and systems later, its time to look at what results from a survey of the representation of academics and academia in children’s picture books. At Amherst College, where I’ve taught for more 20 years (oy, gevalt! ), a couple of years ago a tenure case was brought down in part because of the word “solid.” I’ve put it in quote marks in part because tenure cases are multiheaded monsters: Their rise or fall as a result of countless factors. In this particular one, one of the factors–and, ultimately, a stumbling block–was this much-contested word. An outside reviewer had used it to describe a candidate’s publications record. It became a subject of debate among the Committee of Six and the department supporting the candidate. Here I need to offer a quick crash course through the college’s hierarchical structure, or at least a portion of it. The Committee of Six, a judicial body of elected faculty whose job it is to legislate on a large number of issues, is in charge of reviewing tenure cases once the candidate’s department has offered its recommendations. For these cases, the C6 looks at, among other things, every student evaluation, every letter from peers, and every outside review with utmost dedication. In other words, it is a painful, meticulous process of what I call logocrasy: a Kafkaesque labyrinth of language. The president then endorses or rejects the C6 tenure recommendation. On the witness stand here Tuesday, Beatriz Vergara bit her lip and looked toward her mother and sister in the gallery as Eileen Goldsmith, a lawyer for California’s biggest teachers unions, began cross-examining the 15-year-old. How well certain teachers educated Ms. Vergara and her fellow plaintiffs is at the heart of the closely watched case. Research has pointed to teacher quality as the biggest in-school determinant of student performance, and in recent years many states have moved to simplify dismissal procedures for ineffective teachers and encourage districts to consider teacher performance in layoff decisions rather than conducting reductions in force based only on seniority. For more than a decade, Singapore, along with South Korea, Taiwan, Japan, Shanghai, Hong Kong and Finland, has been at or near the top of international leagues tables that measure children’s ability in reading, maths and science. This has led to a considerable sense of achievement in Finland and East Asia and endless hand-wringing and head-scratching in the West. What then do Singaporean teachers do in classrooms that is so special, bearing in mind that there are substantial differences in classroom practices between – as well as within – the top-performing countries? What are the particular strengths of Singapore’s instructional regime that helps it perform so well? What are its limits and constraints? Is it the right model for countries seeking to prepare students properly for the complex demands of 21st century knowledge economies and institutional environments more generally? Is Singapore’s teaching system transferable to other countries? Or is its success so dependent on very specific institutional and cultural factors unique to Singapore that it is folly to imagine that it might be reproduced elsewhere? University presidents are in unique and powerful positions, overseeing institutions that are supposed to protect and foster free critical inquiry, and serve as safe-zones for the pursuit of intellectual investigation, open debate, and dissent. That’s why it’s particularly disturbing to witness the transformation of Janet Napolitano from DHS director to university system president. In September 2013, former director of the Department of Homeland Security Napolitano became the president of one of the nation’s largest public university systems, the University of California. In her role as president of the UC system, Napolitano oversees almost 19,000 faculty members and over 200,000 students, as well as a staff of nearly 200,000. Put 50 randomly selected U.S. professors in a room. Within 10 minutes they will be complaining about the growing number of administrators in their universities. Professors aren’t right about everything, yet they have a point in this case. An examination of federal data on the explosion in college costs reveals how far colleges have gotten away from their original mission of providing “higher” education. The National Center for Education Statistics reported that in 2010-11, nonprofit colleges and universities spent $449 billion. Less than 29 percent of that — $129 billion — went for instruction, and part of that amount went for expenses other than professors’ salaries. Yes, the $449 billion includes money spent on auxiliary enterprises (food and housing operations, for example), hospitals and “independent operations” (whatever they are). Suppose we subtract the $85 billion that pays for all of that from the total. That leaves $364 billion. The $129 billion for instruction of students is still only 35 percent of that. Colleges’ attempts to curb employee costs by hiring part-time faculty members and using grad students are being offset by administrative hires and rising benefit costs, according to a new study by the Delta Cost Project at the American Institutes for Research. The study uses federal data to examine hiring trends going back to 1990. Over all, it found, colleges have hired at a faster pace from 2000 to now than they did in the 1990s, but that tempo didn’t do enough to keep up with an influx of millennials and other students who flocked to colleges amid the recession. While it’s certainly foolish to rush into committing to college, it’s just as foolish to dismiss it without thought. That’s why when I turned 18 I decided to take a ‘gap year’. I did this because I wasn’t sure what I wanted to do, and it seemed like common sense to gather more information before making any irrevocable, life-altering choices. Lots of my friends were having graduation parties, which is where the topic came up the most (and was the least avoidable). This is what you talk about at that age. You talk about it with parents, friends, friends’ parents, teachers, guidance counselors, admissions officers; almost anyone you happen to be making polite small talk with. I even wound up defending my decision to my doctor during a check-up. Eventually, I started to doubt. Was I taking a huge risk by not going, or even by waiting a year to consider my options? Now that I have more perspective on the situation, it seems absurd that this sort of pressure is heaped upon so many high school graduates every year. It comes forcefully and from all directions. But the urgency is the most confusing part: what real penalty can I expect for waiting a year? Will the job market cease to be there? Is it a race, where the job goes to whoever gets there first? If that’s true, what does that mean for the people who graduate a year after me? And whatever the downsides, how do they compare to rushing into a major life decision (and lots of personal debt) with little idea of what you want out of it?